Caption Slip reads: "Photographer: Mack. Date: 1957-11-11. Reporter: Donoghue. Assignment: Bartenders Cocktail contest. 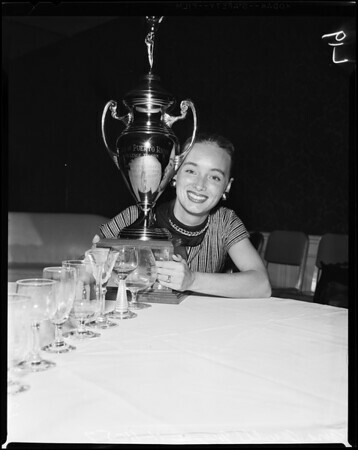 Mrs. Jewell Mayes, 27, Palos Verdes Estates, one of judges at United Kingdom Bartenders Guild competition for best cocktail recipes at the Ambassador Hotel. Trophy is first prize, along with trip to Europe to enter international contest."